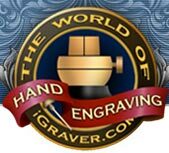 Of the all the types of ornamental hand engraving, relief engraving is considered by many to be ultimate in rich treatment. What sets relief work apart is the removal of the background, or negative space, leaving a raised design. This is time consuming and expensive work, and is generally reserved for finer pieces. 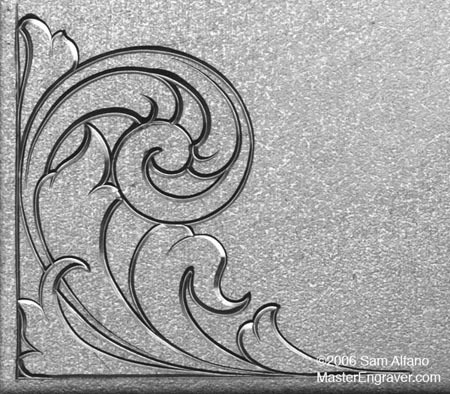 The hallmark of quality relief engraving is a deeply cut background with flat bottom and clean, sharp, sidewalls. 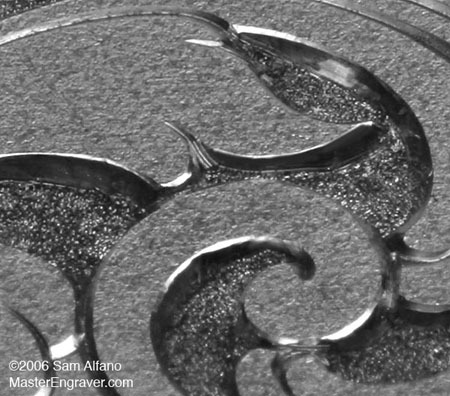 This can be a difficult task for the inexperienced engraver as good graver control is important. The following photos will provide enough information for you to try your hand at relief work. Step 1 - The design is outlined and ready for background removal. Shading of the design is the last step, so be sure not to shade before background work as there's no way to debur or repair a slip without ruining the delicate shade cuts. 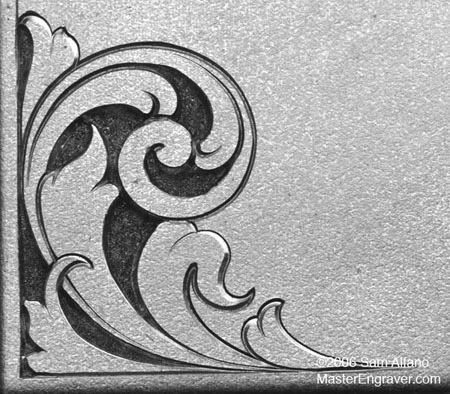 This outline was cut with a 120º graver. Step 2 - Using a square graver, outline the areas of negative space while rolling the graver toward the inside and away from the scrolls. This clears the waste area away from the design, and provides a safe place to work without damaging the design. The square graver is my graver of choice for this step, as a 120º graver is much too wide and increases the likelihood of bumping into your design, especially in tight corners. During this outlining process, I make at least a half-dozen passes, going deeper with each pass. I also pay particularly close attention to the sidewalls, keeping them sharp and crisp. As the background gets deeper, the risk of heel drag increases, especially on inside curves. When doing really deep backgrounds, I will sometimes use a Uniform Heel square graver which has a longer cutting edge than my standard square graver, and allows me to trim sidewalls nicely. Step 3 - After outlining with the square graver, the background is removed with a GRS/NSK Turbo handpiece. This precision air handpiece operates at around 400,000 RPM, and greatly speeds up background removal. I use .4 and .5mm Brassler carbide ball burs. The good news is the Turbo handpiece is fast and efficient, and literally erases steel. The bad news is that in the hands of the inexperienced person, it can be a hairy beast and damage your work before you knew what hit you. When using a rotary handpiece for background removal, be sure to make short pulling strokes. If you push the tool away from you or in the direction of the tool's rotation, it can jerk the bur quickly into your design. Take your time and learn to use it before working on an expensive gun, knife, or article of jewelry. I also use an NSK eMax micromotor for background removal. This tool is the ne plus ultra of micromotors, and features variable speed with high torque. It can handle all jewelers burs and 1.6mm dental burs (with the optional 1.6mm collet), and its slower speeds can be ideal for sculpting and carving metal, not to mention preparing stone seats for diamond setting. For those of you who use a flex shaft, you may find this tool to be easier to handle and more flexible. For diamond setting, its high torque at slow speeds is simply fantastic. While the turbo handpiece is fast and efficient, it's difficult or impossible to shape or carve metal with. Between the two, the engraver will be well equipped for background removal, sculpting and carving, and more. In the above photo, the background could only be bur-removed in the larger open areas, and the tighter areas and corners were removed with the square graver. Where a bur is too large to fit, the material must be removed with a graver. Trying to go just a little bit farther with the bur generally results in damaged work. Small areas like the lower left corner are removed by multiple cuts with the square graver. Step 4 - The background is then stippled with a carbide tool sharpened to a needle point. I use a relatively heavy foot and stipple deeply at around 4200 strokes per minute. What stippling does is texture and darken the background. What stippling does NOT do is flatten irregular or poorly treated backgrounds, so don't assume you can do a rush-job on the background because the stippling will fix it. Remember, backgrounds should be flat with well defined sidewalls. Check carefully for small places in the background that reflect light. Stipple thoroughly to eliminate them. I see a few spots in the photo above that could use attention. Do you see them? There has been much discussion on the merits of 3 or 4-sided stippling tools. It's claimed that a round tool cannot produce as dark a stipple as a faceted one, as it's more difficult for light to reflect from a tiny cavity which has flat walls. I've tried both and the 3 and 4-sided stippling tools do produce dark, beautiful backgrounds. For my work, I find that a round tool gives me the look I'm happy with. The photo above shows a fairly dark background with no paint...only stippling. Some gun engravers can't use paint, and are forced to rely on cutting for their blacks and greys. In such cases the faceted stippling tool probably helps them achieve darker shades. Try both and see what works best for you. Incidentally, I do all my stippling under the microscope, and faceted tools that have wide shoulders can be difficult to see around, so keep them small. The scrollwork above is now ready for shading. A closeup showing deep background with sharp sidewalls. 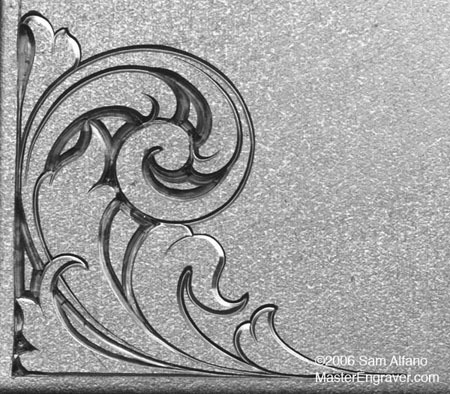 Keep in mind that the sidewalls are extremely important in relief engraving, as they define the depth and are what people see when viewing your work. 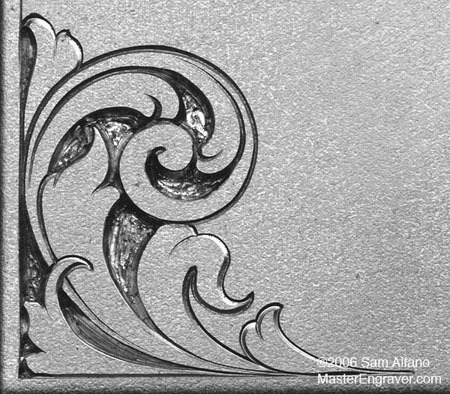 In his later work, Lynton McKenzie paid relentless attention to sidewalls, and used a brightly polished graver to trim them sharp and make them sparkle. Equipment used for this tutorial: GRS GraverMach and 901 handpiece. 1/4mm and 1/2mm round carbide dental burs are available from Brasseler USA.